So you and your buddy/relative/significant other are sitting around with nothing to do. It's raining cats and dogs, and there's a deck of cards on the table. What game are you going to play? There are dozens if not hundreds of really fun card games, but which games are the best of the best? Each game comes with a short description and a link to some more in depth rules. Enjoy! 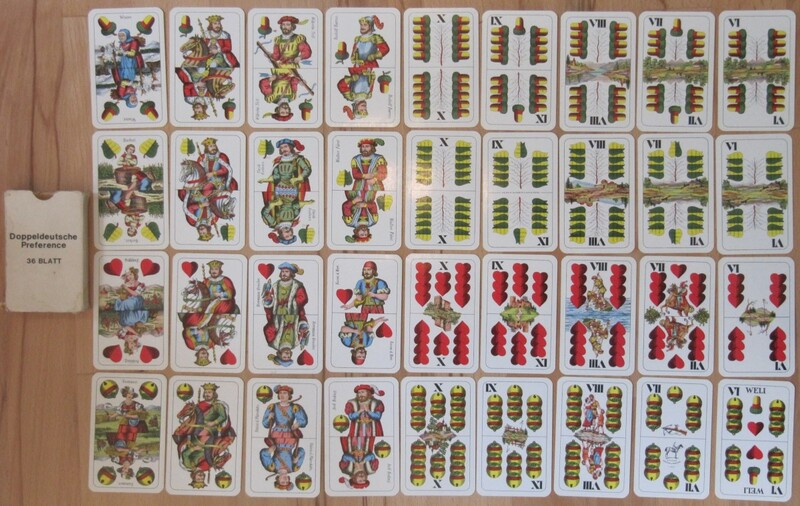 Santase is a Bulgarian card game for two players. Ever heard of it? Maybe you know it as Sixty-Six. Or perhaps Schnapsen. All three games are similar and share the goal of trying to score 66 points before your opponent does. I play Santase more than any other two-person card game. For me, it's the perfect card game for relaxing on a lazy Sunday afternoon. There's strategy involved, but not too much. There's memory involved, but not too much. And, of course, winning also depends on the luck of the draw. Santase uses only 24 cards (9, 10, J, Q, K, A) from the standard deck. To score big, you need to "marry" Kings and Queens of the same suit. If you want to give this game a try, here are the rules to 66. As I said, the rules to 66 and Santase are essentially the same. Crib can be played with more than two people, but I prefer it one on one, heads-up. 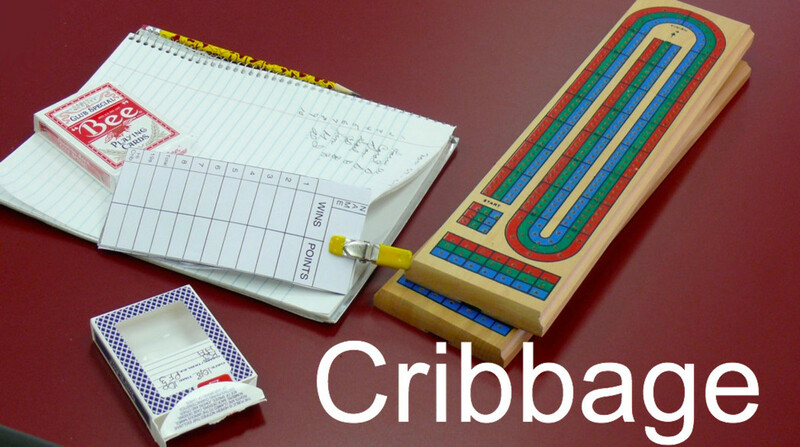 Of course, in addition to a deck of cards you'll need a Cribbage board -- a $10 investment. I made my first Cribbage board in junior high school and still use it to this day. It's ugly, and the holes don't really line up, but it's served its purpose admirably over the years. I think it's the board that makes the game unique and gives it that special flavor. Sure, the rules are clever, especially the one that has each player giving up cards from their hand to form a "crib," but it's the board that makes Cribbage, Cribbage. For me, Gin is all about action. There are a lot of things going on, and I totally lose myself in this game when I play. Forget about conversation Grandma, I'm playing to win! Gin uses a standard deck of 52 cards. Start by dealing ten cards each and flipping over the top card. 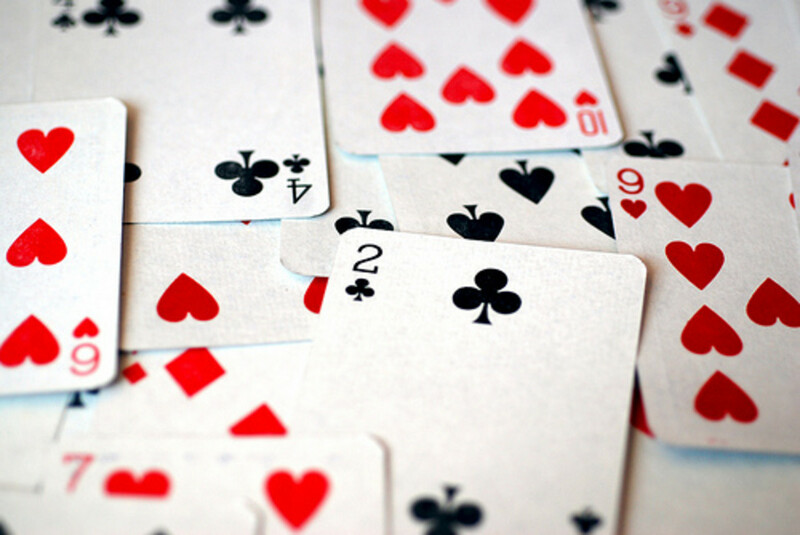 Like other forms of Rummy, you'll focus on building runs and sets (3s and 4s of a kind). Here are the rules to Gin. No, this is not a Spanish game. In fact, it is Ukrainian so go ahead and pronounce the "h". My family plays this game a lot. It's a casual, easy game that is best played by four people playing as teams. But it can also be played by just two people. 2s and 7s are wild. Aces and 10s score points. Here are the rules to Hola. I'm very interested in learning more two-player card games, especially games that are played in remote regions of the world but still use the standard deck of 52 cards. If you have any suggestions, I hope you will post them below. I don't know if crazy eights is obscure.... But it has the option of playing two people. I love spit and James Bond. james it is a very, very ,very, beautiful game. Even if i have not tried it iam sure, that it is great. i will learn how to play it and tryit with my cousins , my brother and sister. continue giving site games because i am sure that you will be very famous. Seep is an amazing card game. You can play it at http://www.seepstation.com/play/ Its really cool and addictive and you get to play this with live people in both 2 and 4 player format. Gin, gin and more gin! My favourite game by far. jett sorry for asking but was is this game? may you explain to me better? thnx very much mike. it still hurts but the life continues. again thnx. hi is any body here? you got lost. where is every body???????????????? hi is any body here? i see that no one is? hi tomorrow my uncle will be burried. my dad now remained alone without, a brother. because both brothers dead. one 35 or 37 years old and the other 57 years old. i am very sad, because my uncle died yesterday by a heart, attack. is someone here? i see that nobody wrote something. i see that you are in vacations. good vacationssssssssssssssssssssss. kdg sorry for asking but is spite and malice? Does anyone know how to play Spite & Malice??? hi. i know that i must have annoyed you, with my words. But this is the way i talk. I want to talk very long. In my common life this happens always. Because i write and talk very very long. Sorryyyyyyyy once again if i have annoyed you with my words. И еще один немаловажный нюанс: эти кремы позволяют тратить меньше времени на растушевку тона, но при этом вы можете быть уверены в том, что никто не догадается о его наличии на вашем лице. Создатели косметики с удовольствием экспериментируют с различными добавками, рассеивающими свет. Фотохромные пигменты, шелковые протеины, нейлоновые жемчужинки или микропризмы - наличие подобных ингредиентов в рецептуре крема свидетельствует в его пользу. hi everyone. tomorrow i have a difficult day, because i have to learn for the biology test, i have to do a project work, and learn the computer book. It is about how to use the computer, there i have 3 lessons to learn. whar should i do with so much home - work? steve y. what is game speed? hi. how is evry body? are you having a nice weekend? hi to every body. i will speak a little albanian. you may think i am crazy but no. i will explain in english what does it means. si jeni mire? si keni kaluar? how are you well.? iam glad for that. how have you passed? wowowoowowowowowow jubalub you surprised me with that. that you are god. it needs a lot of strength and courage, to be god. but iam glad that you are god. No, I am not good.. I am God. Very simple game for 2 players but very difficult to play well. Separate the pack into suits and each player gets a full suit to hold and play with. One of the remaining suits (say, hearts) is shuffled thoroughly and placed face down - the top card is turned up. Each card is worth its face value Ace=1.....King = 13. The aim of the game is to win the most points. Imagine that the upturned card is a 7. Each player then 'bets' a card from their suit and lays it face down. Both cards are then turned face up and the highest card wins the 7. 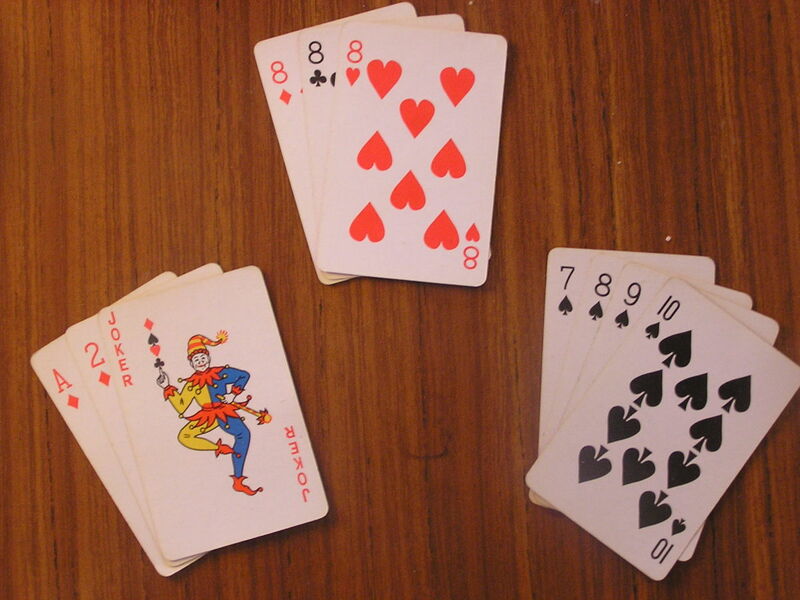 The 3 cards are piled near the winner with the 7 showing. The next heart is then turned over and betting begins again. And so on. If both players bet the same value card for the 7 (say a 6) the cards stay in the middle and the next heart is upturned and added to the 7. The game is full of bluff/strategy as each player aims to win the value card with the minimum bet - eg, if I thought you were going to bet a 6 to win the 7 I might play an Ace or two. But then you might think I'd do that and play a 3 to win. But then I should really play a 4 ...etc. As there are 91 pts available, the first person to reach 46 wins. montieur is a fun fast 2 player card game. the aim of the game is to get rid of all your cards. half the cards are dealt to each player. each player then takes four cards and put them face up in a row next to their decks( with a gap in the middle ). then each player takes one card and players it in the middle. both players then flip over the cards at the same time. 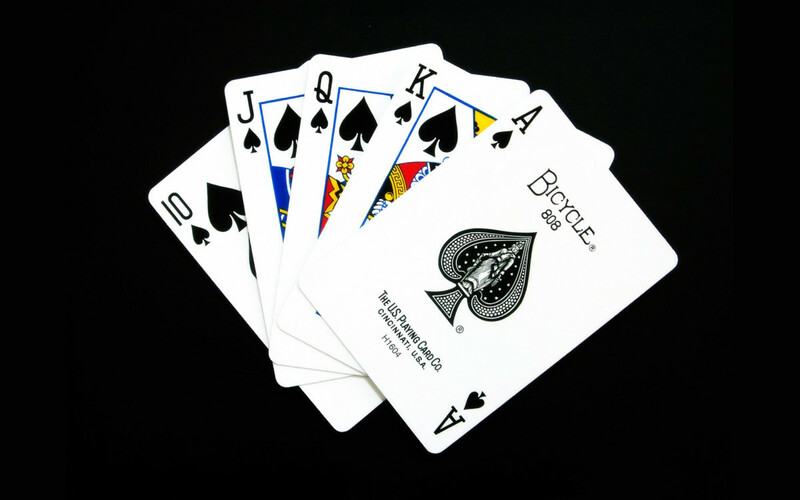 you can then put cards which are either higher or lower from your four cards( aces can go on kings and vice versa). you can also put down more cards in your row as long as the maximum is 4. Jokers can go on anything. When both cards are the same, you can shout monteiur. The other person then takes all the cards in the 2 piles. 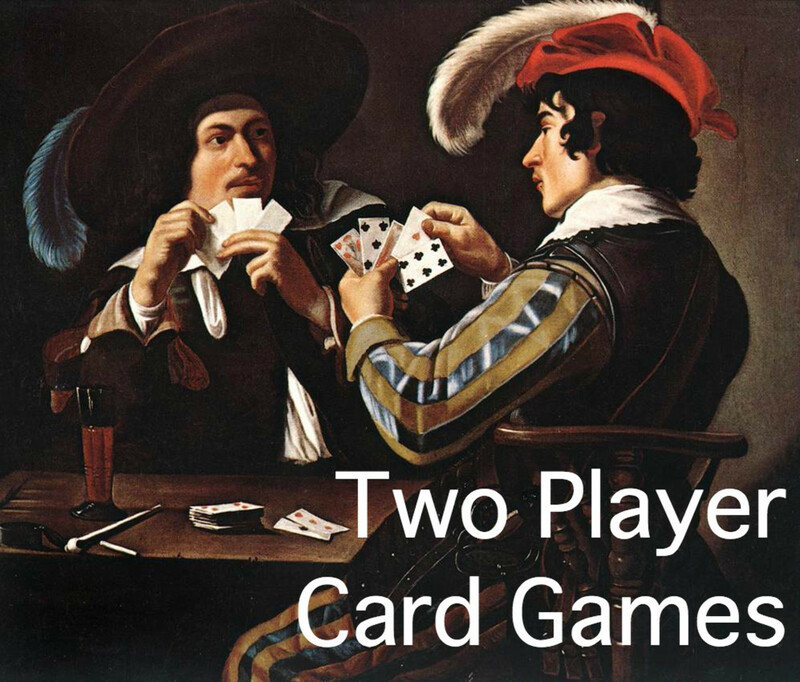 When neither player can put a card on any pile, you put the piles aside and both players put down two new cards. The piles put to side are still given to player who has to take the piles because the other players shouted monteiur. I personally like to play a first game where the cards are shuffled. I then very sloppily shuffle for the second game. a lot of the cards are in order so the game becomes very fast. Definitely add the game speed. 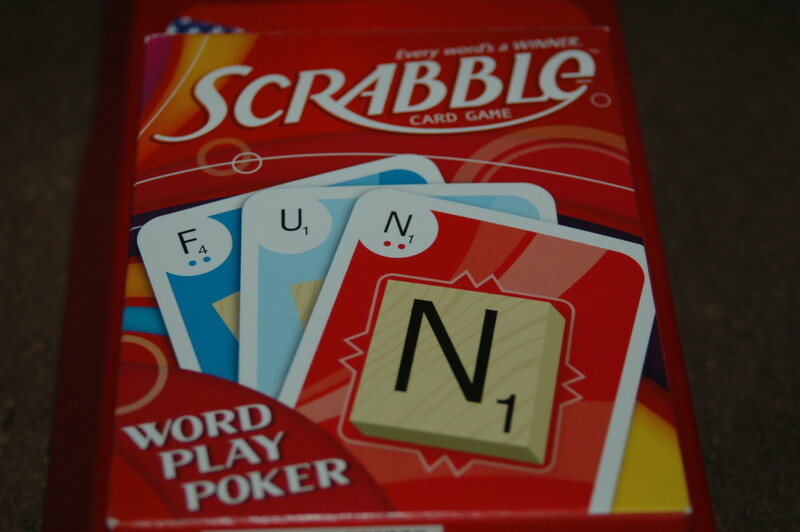 Me & my friends sit for hours playing - its so addictive! We play 3 13 alot - not the same as 13. 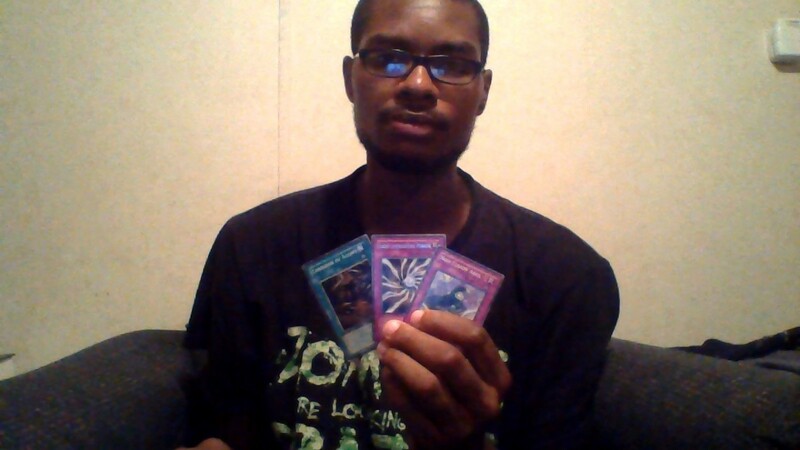 You deal 3 cards for the 1st round & 3's are wild, 4 cards second round and 4's are wild, etc. until you get to 13 cards and K's are wild. The game plays like rummy making runs or matches of 3 or more - lowest score wins. Need to use 2 decks for 3 or more players. You can google the official rules. how is every body . tomorrow iam going to show you game with the cards that we play hre in albania. it is a little hard to explain but i will do it. marcus8 very well. albania is a very very beautiful country thanks for asking. and where are you from marcus8 and hows your country. these games are for all ages and i really enjoy them!!!! Thanks!!! hi. i love ice cream you are right ice cream is the best. Guess wat!! Ice cream is the best!!!!! what is that whist joe. you don't like that albania is in the final ofeurovision directly. i now that all of you are thinking that iam a stupid girl but no. may be you are thinking that for the coments that i wrote i mean that i wrote so may coments. those coments were not to get attention but new friends and i have no friends. and about that the coments that you write are about me i didn't mean that. my self it is not important here. but i like to read your coments what you write to each other. shutupfag i now that the coments arent about me, but i said that only to read what you boys and girls may write to each other. i now my self it is not important here. shut up esmerelda no one cares and the comments aren't to you so just shut up! iam writing only to say hello. hellooooooooooooo. do you have any idea how is to read your own coments. ok. why all of you are remaining in silence. i want you to write something.